Regular kevinEats readers may be surprised to find me dining in Wisconsin. I'd come here to visit my former college roommate from Berkeley, who was graduating from the University of Wisconsin at Madison. I'd inquired about having a nice dinner while I was in town, and without much hesitation, he avowed that L'Etoile was the best that Madison had to offer, and so off we went. L'Etoile was founded over 30 years ago, in 1976, by a then 23-year old Odessa Piper. Odessa's focus for L'Etoile was to engender a tight network of local artisanal farmers to supply her nascent eatery, an attitude that pervaded nearly every aspect of the restaurant. In 2005, Odessa sold ownership of L'Etoile and its vast supplier network to her Chef de Cuisine at the time, Tory Miller, and his sister, Traci Miller. 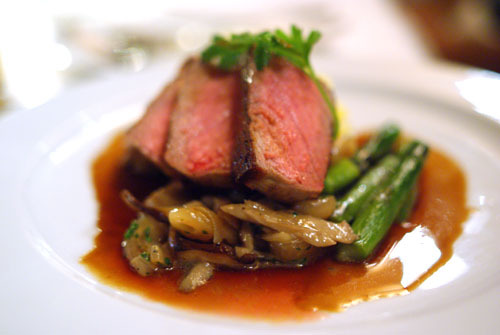 Tory, for his part, was formally trained at the French Culinary Institute in New York, and after graduation, worked at a number of establishments, including Eleven Madison Park and Judson Grill, before coming to L'Etoile. Tory and Traci have arguably expanded Odessa's way of thinking even further. 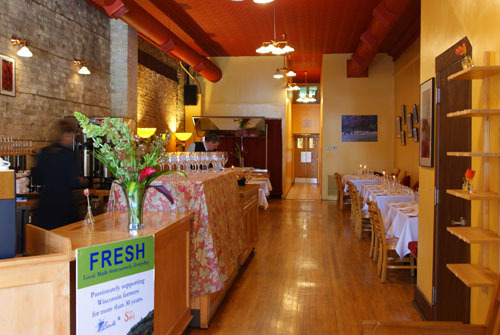 Their passionate support of Wisconsin farmers is evident even before stepping into the restaurant. 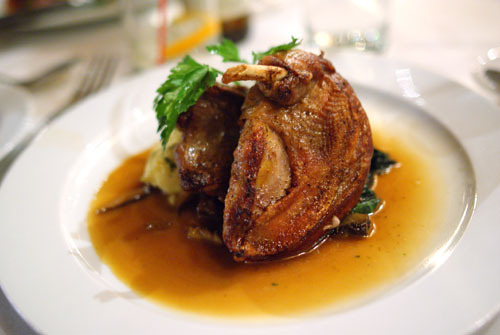 Local, organic, and naturally-raised ingredients are absolutely key, and the staff at L'Etoile follows a philosophy that celebrates the concept of farm to plate. With this comes a deep, profound respect for the land, the terroir, and its relationship with people, leading to the creation of a burgeoning Wisconsin "slow food" culture that embraces local, seasonal cuisine. However, L'Etoile is not regionally exclusive; although the menu is primarily composed of local ingredients, the restaurant sources products from all over the world when doing so makes sense. 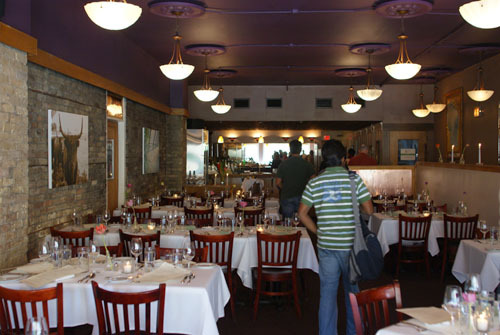 L'Etoile is located in a quaint building in the very heart of Madison, situated on the north corner of Capital Square. Free street parking is available in the surrounding area after 6:00p. The building actually houses two restaurants: the more casual Café Soleil is on the ground floor, while L'Etoile's second floor dining room overlooks Capital Square. 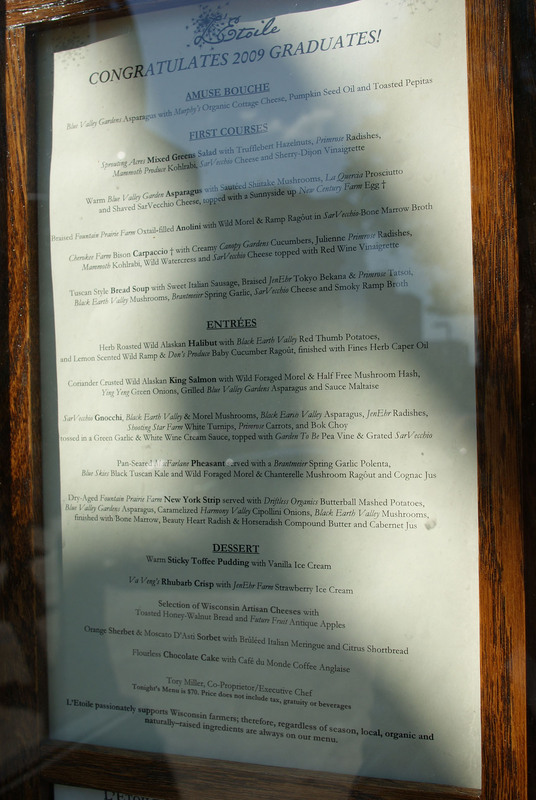 For University commencement, the restaurant offered up a $70, four-course prix fixe menu. 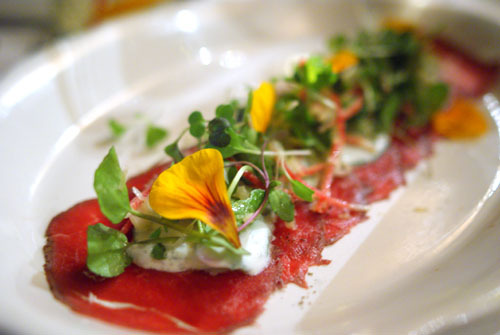 L'Etoile's menus are inspired by the bounty of small, local farmers, paired with classical French technique. 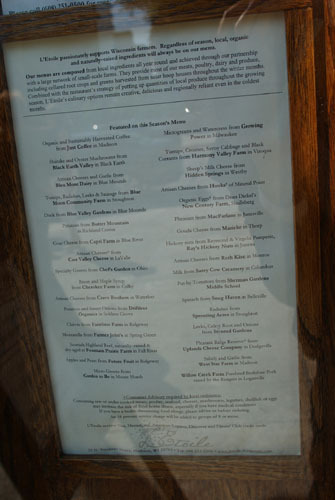 This commitment to quality is evident just by reading the menu: Tory is keen to spell out the supplier for nearly every component of every dish on the carte (resulting in some of the most prolix menu descriptions I've ever seen!). A separate page, meanwhile, explicitly pays homage to the featured suppliers (right photo). Click for larger versions. 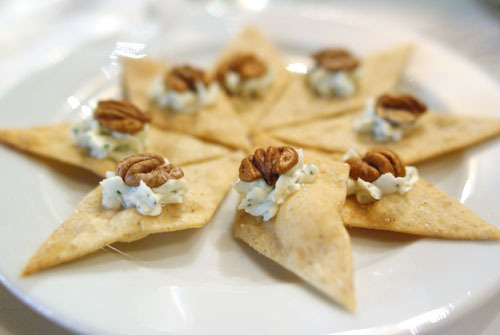 Shortly after being seated, we were presented with plates of Hickory Nut Crackers, topped with Herbed Goat Cheese and Hickory Nut. A simple way to kick things off, the strong initial nuttiness of the bites was nicely tempered by the tangy cheese. 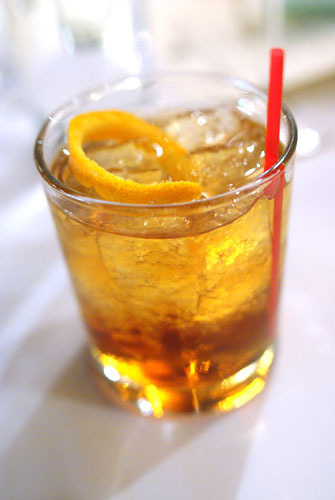 To quench my thirst, I started out with a Godfather [$9], made with Bulleit Bourbon and Disaronno Amaretto, on the rocks. The bittersweet almond flavor of the Amaretto was what I noticed first, but this gradually led to the woody, vanilla-tinged notes of the Bulleit. Nice. With Murphy's Organic Cottage Cheese, Pumpkin Seed Oil and Toasted Pepitas. I really enjoyed this, finding the sharp, vegetal flavor of the asparagus tempered expertly by the creamy cottage cheese. The toasted pepitas (basically pumpkin seeds), meanwhile, added a fantastic crunch to the amalgam, as well as a smoky flavor element. Presented by varietal, L'Etoile's wine list is fairly comprehensive, focusing on smaller growers that offer high-quality and high-value. 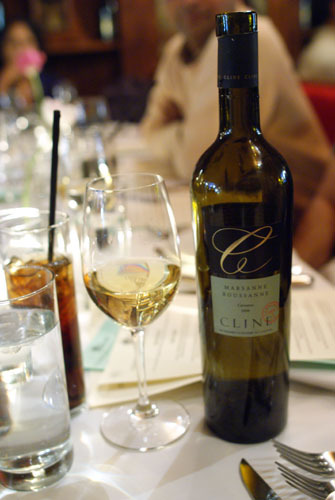 We ordered a bottle of the 2006 Cline Marsanne/Roussanne, Carneros [$37]. I noted plenty of stone fruit here, with some citrus and pear, all over a crisp minerally base--a sweet, floral, easy-drinking wine. With Sautéed Shiitake Mushrooms, La Quercia Prosciutto and Shaved SarVecchio Cheese, topped with a Sunnyside up New Century Farm Egg. Although this was an asparagus dish, the vegetable didn't take center stage. 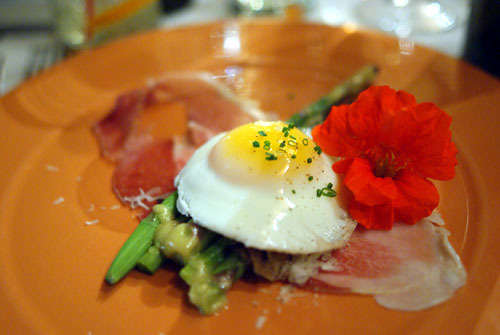 Rather, the key here was the interplay between the crisp, bitter asparagus, the rich, creamy egg, and soft, salty ham. All the elements were superbly balanced, leading to a very satisfying experience. My favorite of the appetizers, this actually reminded me a bit of the asparagus I had just days earlier at Canelé. With Creamy Canopy Gardens Cucumbers, Julienne Primrose Radishes, Mammoth Kohlrabi, Wild Watercress and SarVecchio Cheese topped with Red Wine Vinaigrette. I've had countless carpaccios in my time, but I believe this was the first bison version I've tried; it actually wasn't much different than beef, with a mild flavor that didn't stand out on its own. Instead, the buffalo acted as a canvas on which bracing, biting flavor of the various veggies--cucumbers, radishes, kohlrabi, watercress--interacted with the salty, nutty cheese. The end result was delicious. With Sweet Italian Sausage, Braised JenEhr Tokyo Bekana and Primrose Tatsoi, Black Earth Valley Mushrooms, Brantmeier Spring Garlic, SarVecchio Cheese and Smoky Ramp Broth. 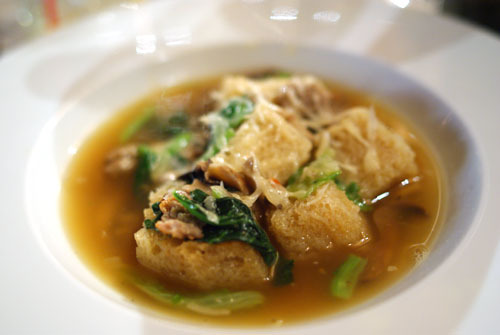 The bread provided most of the body of the soup, but the flavor resided in the other elements. I really liked the sweet, savory sausage and how that factor complemented the crisp, sharp vegetables. That interaction drew most of my attention, but the addition of cheese and mushrooms did add even more gravity to the hearty dish. With Wild Foraged Morel and Half Free Mushroom Hash, Ying Yeng Green Onions, Grilled Blue Valley Gardens Asparagus and Sauce Maltaise. Texture-wise, the salmon was done just about perfectly--moist, flavorful on the inside, crispy on the outside. 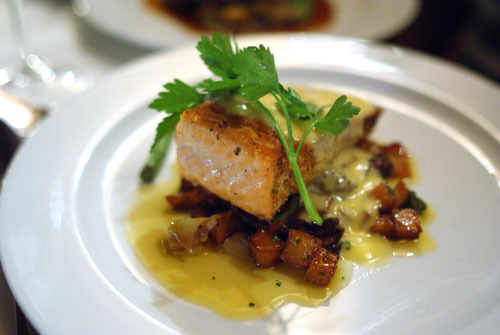 I enjoyed the fish on its own, though I felt that its accoutrements did overpower it somewhat, the mushrooms especially. FYI: Sauce Maltaise is a French sauce commonly served with asparagus--think Hollandaise tarted up with blood orange. Served with a Brantmeier Spring Garlic Polenta, Blue Skies Black Tuscan Kale and Wild Foraged Morel and Chanterelle Mushroom Ragôut and Cognac Jus. I found the bird here quite delicious, with an absolutely lovely crisp, flavorful skin. Unfortunately, the flesh was a bit dry, and didn't have the juiciness I was looking for. I could've done without the polenta, as I'm not a fan of it in general, but the application of the slightly bitter kale was welcomed. Served with Driftless Organics Butterball Mashed Potatoes, Blue Valley Gardens Asparagus, Caramelized Harmony Valley Cipollini Onions, Black Earth Valley Mushrooms, finished with Bone Marrow, Beauty Heart Radish and Horseradish Compound Butter and Cabernet Jus. Cut from grass-fed Scottish Highland beef, the strip steak wasn't terribly fatty, though its flavor was definitely there. The accompaniments provided here weren't particularly creative, but they did their job, adding subtle sweet and peppery overtones to the meat. My second cocktail was the Five-year Plan [$8], comprised of Southern Comfort and Blue Skies cola with local strawberry purée. The mix of ingredients resulted in a soft, fruity palate with pronounced coconut notes. It went down easy. With Toasted Honey-Walnut Bread and Future Fruit Antique Apples. Being in Wisconsin (a state that makes more cheese than any other in the Union), I had to try the fromage course right? Starting from the right, the first cheese was the Benedictine from Carr Valley Cheese Company (a Wisconsin producer with over 100 years of history). Made from sheep, goat, and cow milk, its flavor was mild, tangy, yet so focused. Next up was Fayette Creamery's Little Darling cow's milk cheese. This was harder in consistency, and more rustic, with some earthy undertones and more complexity. Finally, we have a blue cheese from Bleu Mont Dairy. 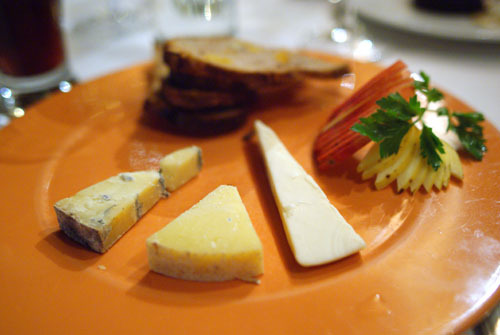 Produced using unpasteurized cow's milk, the cheese was fairly mild for a blue and a bit nutty--very good. 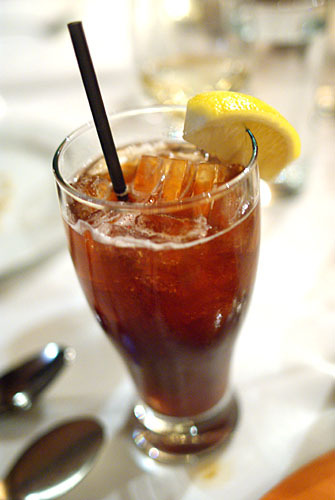 With Café du Monde Coffee Anglaise. 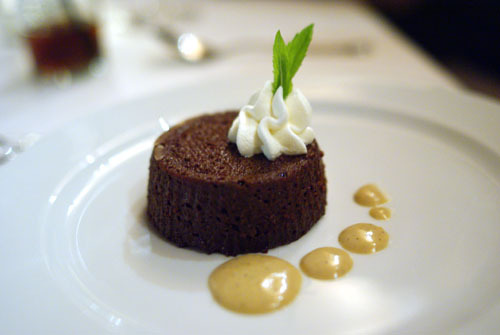 This was a somewhat pedestrian chocolate cake, with a pleasant bitterness nicely set off by the coffee Anglaise. Unexciting, but tasty. 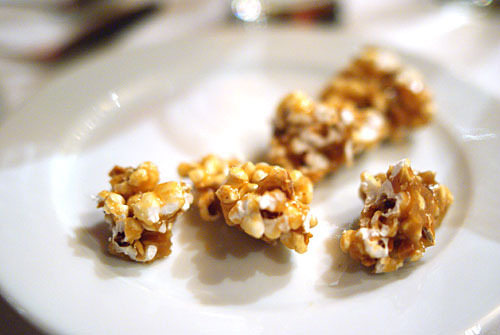 To finish up, we were given plates of caramel corn, which our server referred to as Fiddle Faddle. 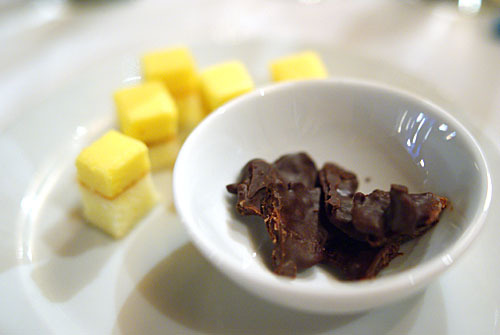 We also got a plate consisting of tangy miniature passion fruit icebox cakes and bits of candied and chocolate-covered bacon. The bacon was obviously the most interesting item here, with a pronounced sweetness that more than offset its naturally saltiness (taking a page from the Alinea playbook perhaps?). Despite a few minor missteps, I really relished my time here. L'Etoile is all about top-quality, local, seasonal ingredients, deftly prepared, and in that regard, it succeeds with flying colors. The restaurant's imperative to maintaining its philosophy is apparent in the food, the ambiance, the staff, just about everything--there's something I can definitely appreciate about holding steadfast on such a commitment. 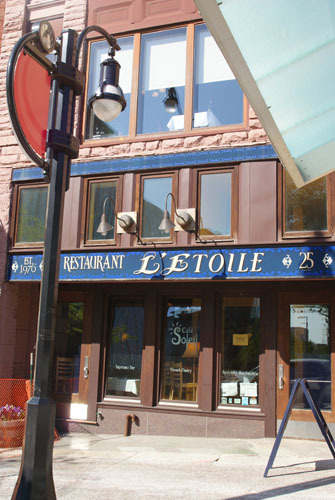 L'Etoile seems to be just about the perfect restaurant for a place like Madison, and is definitely worth a try if you're ever in the area. I would never expect to find something like this in Wisconsin! The Amuse Bouche looks DIVINE. And what a place to CHEESE OUT! Awesome photos, like I was there. your photos have really gone up another level because of that sigma. The bokeh is fantastic...makes me wonder how it'll perform on my Nikon. This 35mm's great, but the bokeh isn't as great as yours. The macro helps too I bet. Sharon: I didn't either, but I'm sure glad I did! Jo: That amuse was something. Looking at it, I didn't expect much, but it really delivered--simple, yet superb. Matt: Yeah I'm a fan of that shallow DOF look; the short focusing distance certainly helps in that regard. I think I was at f/2.8 for most of the photos--not even wide open. Now that I've gotten used to the DSLR, I can't go back. I had an impromptu meal at Pizzeria Mozza today (finally, I know), and only had the Fuji with me. It was so unsatisfying compared to the Sony. Kevin, I'm glad you made it to Wisconsin! As a student at the University of Wisconsin Madison, the restaurant lies about 10 minutes from our union. Although a little pricey for a college student, I always try to save up just enough to go here once a month as a treat. It really is an amazing restaurant with a GREAT cheese selection and one of our top picks for our gourmet food club here at madison, which hopefully can become more successful next year! Once again thanks for the great review! Thanks Mike, I'm glad I made it out too! I went to Berkeley undergrad, so L'Etoile sort of reminds me of our Chez Panisse. What is this "gourmet food club" you speak of? Unfortunately I'm not in town any more (left on Sunday for Chicago--I took my roommate to Alinea). However, I checked out Le Chardonnay and it looks like a great spot as well. The Moules Frites nights sound like fun! Hey kevin, the gourmet food club is a club i started last semester kinda dedicated to foodies who want to experience great food and atmosphere. Although not too successful, I am striving to recruit more foodies like myself to bring this club to where I feel it can be! Hopefully we can get chefs to come to our meetings and maybe show us some recipes and how to select food for the restaurants! I am really excited for next year as I think this can be a huge success! Once again, I want to commend you on the incredible food reviews and on the off chance your in Wisconsin, I would love to have dinner with you! Reading about all the great restaurants you have eaten at (le bernadin, alinea, french laundry, etc...) it would truly be an honor and an absolutely amazing experience! I would've liked to have had a student group like that during my years at Cal. What kind of events have you held? Do you have a web site? Unfortunately, I probably won't be returning to Madison any time soon, so I think it's more likely that you'll find your way to LA. Shoot me an email if you're ever down here, and we can definitely work something out. I was just wondering what the dress code is here? we are going there this wknd. They're pretty laid back about the dress code, but I would keep it dressy casual. I have the privilege of knowing some of the farmers that supply L'Etoile. Each of them is as dedicated and fanatical about food as Tory Miller. That's great to hear Keith. Such dedication on the part of the restaurant as well as the suppliers is really palpable in the food I think. 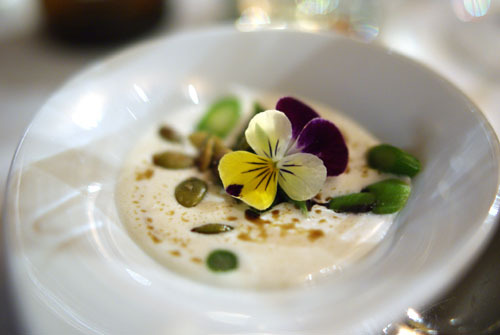 What did you do with the flowers on the plates Warm Blue Valley Gardens and Amuse Bouche: Blue Valley Gardens Asparagus? I ate them, of course!